Our OpenStock module, available for OpenCart versions 1.5.1.3 and above, gives you greater control over your product options and stock levels. With OpenStock you have the ability to assign specific stock levels, SKUs, discounts, special prices, images and more to individual option combinations. 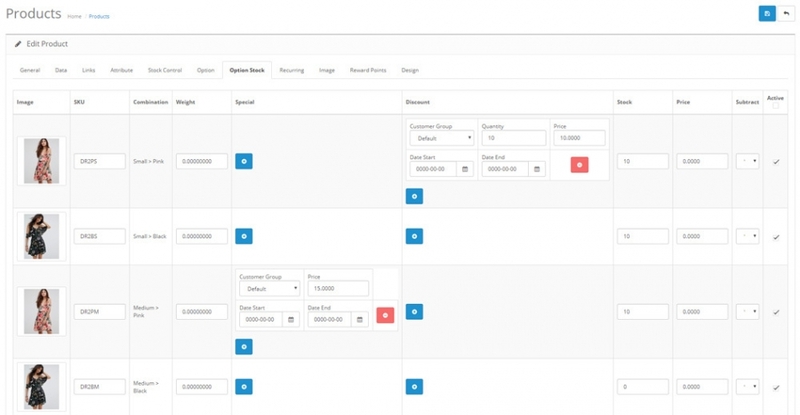 Once you've installed OpenStock it's very easy to start adding OpenStock options to your products. When adding a new product or editing an existing product, navigate to the "Stock Control" tab and change the "Has Options" setting to "Yes - OpenStock". Once you've changed this, two additional tabs will appear - "Option" and "Option Stock". Stock Control options when using OpenStock. In the "Option" tab, search for your product options and add them to your product. Here you can choose if the option is mandatory and set the option values. After adding your options, save your product and then edit it again - this will generate the option combinations and show them in the "Option Stock" tab. In the "Option Stock" tab, you'll be able to add information for each possible option combination. The Option Stock tab when using OpenStock. If you have a lot of products or would like to save time when setting up OpenStock for the first time, we have included a "Bulk Create Variants" option. This can be found in the module settings and will modify all products which have options and has the "Has Options" setting set to "Yes - Regular". Remember to take a full backup of your database and check that you're happy with the default settings (found in the "Settings" tab) before using this feature. When OpenStock is being used on a product, the "Special" and "Discount" tabs will be hidden. Instead, you can add special and discount prices within the "Option Stock" tab for each option combination individually. If you would prefer the original "Special" and "Discount" tabs to show, these can be enabled in the module settings. Simply edit the OpenStock module, go to the "Settings" tab and change "Show "Special/Discount" Tabs" to "Yes". OpenStock was built to work with a fresh installation of OpenCart using the default theme. If your store is using a different theme or you've made significant changes to the default theme, it's highly likely that OpenStock won't work correctly with your store. You will need to modify the vqmod/xml/openstock_customise.xml file for OpenStock to correctly work, alternatively we offer a theme patch service - please get in touch for more information.